En las siguientes clases veremos detalladamente las conchas o abanicos, los racimos, las piñas y los bodoques. Aprenderemos a tejerlos y diferenciarlos. In the following classes we will learn to make and differentiate shells, clusters, puff stitch and popcorn stitch. 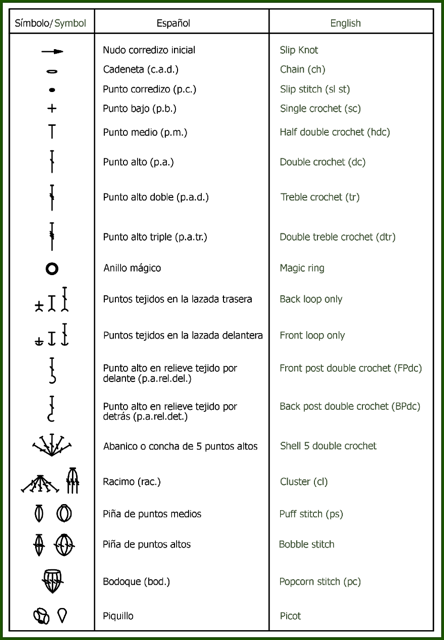 Empezaremos por las CONCHAS O ABANICOS de cualquier patrón de crochet. Son aquellos puntos que se tejen varias veces en un mismo punto de la vuelta anterior. Un grupo de conchas produce un aumento en nuestro trabajo que debe compensarse en vueltas posteriores. In this class we will learn SHELLS. These are stitches that are made several times in the same stitch of the previous row. These groups of shells produce an increase that must be compensated for in the following rows. Vamos a ver paso a paso un ejemplo de tejido de conchas o abanicos. Lets see an example step by step. Este elegante punto se basa en la repetición de dos vueltas en las que se alternan puntos con conchas grandes y pequeñas. This elegant stitch is based on the repetition of two rows in which you alternate stitches with large and small shells. VUELTA INICIAL: Tejemos 21 c.a.d. VUELTA 1 DERECHO: Tejemos 1 c.a.d. de subida y 1 p.b., 1 p.b., saltamos 3 c.a.d. de la VUELTA INICIAL, 1 concha (3 p.a. 1 c.a.d. 3 p.a. ), saltamos 3 c.a.d., tejemos 1 p.b., 1 c.a.d, 1 p.b., saltamos 3 c.a.d, concha, saltamos 3 c.a.d. y terminamos con 2 p.b. VUELTA 2 REVÉS: Tejemos 2 c.a.d. de subida y 1 p.m., 3 c.a.d., 1 p.b. en la c.a.d. central de la concha de la vuelta anterior, 3 c.a.d., concha (1 p.m. 1 c.a.d. 1 p.m.), 3 c.a.d., 1 p.b. en la c.a.d. central de la concha de la vuelta anterior, 3 c.a.d. y terminamos con 2 p.m.
VUELTA 3 DERECHO: Tejemos 3 c.a.d de subida y 3 p.a., 1 p.b. antes del p.b. de la vuelta anterior, 1 c.a.d. sobre el p.b. y 1 p.b. detrás del p.b. de la vuelta anterior, concha (3 p.a. 1 c.a.d. 3 p.a. ), 1 p.b., 1 c.a.d. y 1 p.b. Terminamos con 4 p.b. VUELTA 4 REVÉS: Tejemos 1 c.a.d. de subida y 1 p.b., 3 c.a.d., concha (1 p.m. 1 c.a.d. 1 p.m.) en la c.a.d. central de los p.b. de la vuelta anterior, 3 c.a.d., 1p.b. en la c.a.d. central de la concha de la vuelta anterior, 3 c.a.d., concha, 3 c.a.d. y terminamos con 1 p.b. VUELTA 5 DERECHO: Igual a VUELTA 1. ROW 1 RIGHT SIDE: 1 ch to start the row and 1 sc 1 sc, skip 3 ch of the foundation row, 1 shell (3 dc, 1 ch, 3 dc), skip 3 ch, 1 sc, 1 ch, 1 sc, skip 3 ch, shell, skip 3 ch and finish with 2 sc. ROW 2 WRONG SIDE: 2 ch to tart the row and 1 hdc, 3 ch, 1 sc. in the central chain of the shell of the previous row, 3 ch, shell (1 hdc, 1 ch, 1 hdc), 3 ch, 1 sc in the central chain of the shell of the previous row, 3 ch and finish with 2 hdc. ROW 3 RIGHT SIDE: 3 ch to start the row and 3 dc, 1 sc before the sc od the previous row, 1 ch over the sc and sc behind the sc of the previous row, shell (3 dc, 1 ch, 3 dc), 1 sc, 1 ch and 1 sc Finish off with 4 sc. ROW 4 WRONG SIDE: 1 ch to start the row and 1 sc, 3 ch, shell (1 hdc, 1 ch. 1 hdc) in the central chain of sc of the previous row, 3 ch, 1 sc in the central chain of the shell of the previous row, 3 ch, shell, 3 ch and finish with 1 sc. ROW 5 RIGHT SIDE: As row 1. En el PUNTO ABANICOS EXTENDIDOS las conchas o abanicos se completan en varias vueltas. Es ideal para finos hilos de algodón o seda. Consiguiendo un resultado es muy ligero y vaporoso. In this example shells are completed in several rows. It is ideal for fine material such as cotton or silk. The result is very light and airy. En el PUNTO PAVO REAL las conchas o abanicos están formados por numerosos puntos. Queda especialmente vistoso cuando utilizamos un hilo de algodón fino con colores degradados, multicolor o jaspeados. In the PEACOCK STITCH shells are formed by numerous stitches. It is especially attractive when using fine cotton with gradients colors, multicolor or marbled. Este punto denominado PUNTO DE CONCHAS CALADAS lo forman conchas o abanicos separados por cadenetas. Está especialmente diseñado para prendas grandes en colores neutros como la ropa de cama de bebé. This stitch named LACE SHELLS STITCH is formed by chains. It Is especially designed for big clothes in neutral colors like baby blankets. Los puntos que forman la concha o abanico pueden estar formados a su vez por varios puntos como el denominados PUNTO ABANICOS CON PÉTALOS. Es especialmente indicado en tejidos con un poco de volumen. Será aconsejable utilizar un número de aguja mayor al indicado en el hilo por el fabricante para que resultado no sea rígido. Shell stitches can be form by a combination of stitches like PETAL SHELL STITCH. It is especially good in garnet with little volume. It is advisable to use a number of needle higher than indicated in the ball by the manufacturer so that result is not rigid. Esperamos que esta clase haya aclarado algunas de vuestras dudas sobre las conchas o abanicos. We hope that this class has clarified some of your questions about shells. Esta entrada se publicó en ESCUELA DE CROCHET y está etiquetada con abanico de ganchillo, Conchas de ganchillo, crochet shells en 3 julio, 2016 por Mondays crochet. Muchísimas gracias! Nos ha encantado lo de hermanas. Aunque no lo seamos, nos sentimos hermanadas con todos los que nos seguís con tanto cariño. Que monada, y como siempre hecho con amor.